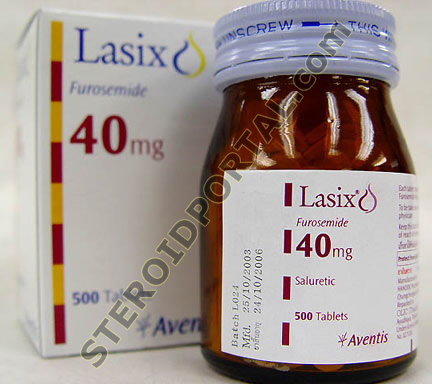 Lasix is a brand name for the drug furosemide, a very potent diuretic. Technically Lasix belongs to a class of drugs known as loop diuretics, which will cause the body to excrete water as well as potassium, sodium and chloride. Loop diuretics including Lasix are among the strongest such drugs available, having an extremely dramatic effect on fluid levels in the body. Potassium levels need to be particularly watched, Lasix greatly increasing the amount excreted. The use of a prescription potassium supplement therefore is often required to keep levels in balance, otherwise a serious heart complications might develop. Mistakes in potassium dosage have equally serious consequences, so Lasix is clearly a risky item to use. But when an athlete needs to shed water, it is very difficult to find something like Lasix that works better. Athletes use diuretics including Lasix for a couple of specific purposes. Competitive athletes use Lasix to drop water weight, in an effort to make adjustments in their weight class standings. Since the weigh-in is most often a day or days before a competition/match, one can drop their bodyweight considerably and be back to normal within hours after rehydration. Use of Lasix logically seems to provide an unfair advantage, the athlete competing at a much heavier weight than believed. This advantage of Lasix is only offset by the now near universal nature of this practice. Bodybuilders also rely heavily on Lasix when preparing for a contest. It can efficiently lower subcutaneous water concentrations, helping to produce that super-ripped look so common on stage today. Make no mistake; a winning look is extremely difficult to obtain without some form of diuretic for example Lasix. Lasix is prepared as both an oral tablet (usually 20-40mg per tablet) or IM/lV injection solution, the injection being much more rapid in effect. The dosage and method of Lasix's administration is tailored to the individual, dependent on the desired goals and condition of the athlete. Tablets are the most common form administration. Each oral Lasix tablet becomes effective about 1 hour after ingesting and will remain active for an additional 3 or 4 hours. The athlete will usually start with a mild dose of Lasix, and add to this amount accordingly later in the day. The initial dosage is usually 20 to 40mg, with the maximum amount usually not to exceed 80mg. The user will attempt to calculate the optimal Lasix's dosage, and determine the best intake schedule in relation to the show or competition. In order to minimize the side effects associated with Lasix, it is generally used for no longer than a few days. Since Lasix has such a strong effect on electrolyte and potassium levels, it is much safer to addition a potassium sparing agent like Aldactone® (spironolactone) than it is to keep increasing the amount of Lasix used. A combination of 50mg Aldactone® and 20mg Lasix would be a good starting point, having roughly the effect of a 40mg Lasix tablet without the notable potassium loss. This dosage is repeated 2-3 times during the day and the effect judged to determine the optimal dosage. It is important to remember that Lasix can be active for many hours. It can become difficult to control the dehydrating effect with an overlapping schedule, so one should be careful not to administer such diuretics including Lasix too frequently. The injectable is a much more powerful version of Lasix. It can be administered both intramuscularly and intravenously, depending on the intensity the user is looking for. The IV method is extremely fast, the strong effect of Lasix felt in a matter of minutes. Since the injection is much more powerful than the oral, the dosage of Lasix is to be considerably reduced in comparison. The injected dosage is usually in the range of 10-40mg, rarely going any higher. Drug testing for Lasix at bodybuilding competitions has increased the popularity of last minute IV diuretic use, a very dangerous practice. Instead of slowly shedding water the few days prior, the user is forced to wait until after the �piss-test�. Then in a frantic rush to remove subcutaneous water before the show, the drugin this case Lasix is administered. The user often has little time to adjust the dosage, resulting in a number of fatal mistakes in recent years. The effect of Lasix is actually easier to control with the injectable under normal conditions. When there is room to experiment, adjustments in dosage are much easier to make (the user not having to wait very long to se an effect). And the optimal dosage of Lasix is certainly less trouble to calculate for a later time as well, the user havin fewer variables to worry about. But again, when used in a rush Lasix can be extremely dangerous. Lasix is widely available. Lasix is manufactured and sold under many different brand names, in many countries. No version of Lasix (or any other diuretic) is currently being counterfeited. When found on the black market Lasix can therefore be trusted. Although it is doubtful these will circulate, make sure never to purchase the 500mg Lasix tablets. These are used only in severe medical conditions, and contain a dosage that could prove fatal to a healthy person.